The Saint Benedict Schola Cantorum is a choir based in State College, Pennsylvania. We specialize in singing Gregorian Chant and Sacred Polyphony. Please read more about us and our history, and, please join us at one of our upcoming liturgies to experience this ancient music as "sung prayer"! 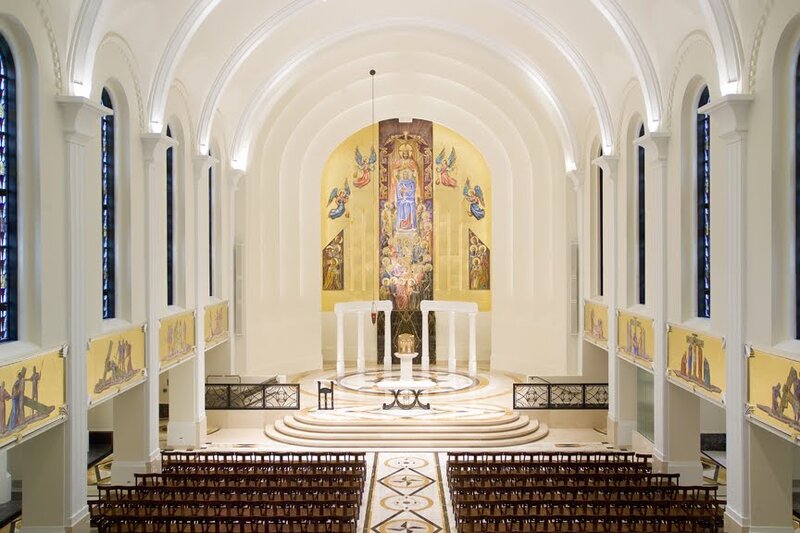 Jubilee Solemn Mass in Patton On Sunday, May 27, 2018, we will celebrate a double anniversary of priestly ordination: Fr. Ananias, O.S.B., pastor of Queen of Peace in Patton, will celebrate his 25th anniversary of ordination, and Fr. Peter Crowe, our fellow State College native, will celebrate his 1st anniversary. At 1pm, there will be a Solemn High Mass in the extraordinary form, celebrated by Fr. Ananias, followed by a reception. The celebration will conclude with Vespers at 6pm. Those who wish to attend the reception are asked to contact the parish for a head count. Tenebrae at Queen of Archangels Chapel, Snow Shoe, Good Friday @8pm The service of Tenebrae will be sung at the Queen of Archangels parish chapel, 204 South 4th Street, Snow Shoe, PA. This service of "Darkness" is based on Vigils of Holy Saturday, from the traditional form of the Divine Office. It includes powerful symbolism, psalms and readings: we are deprived of the Lord's presence following his betrayal and Passion, but there remains the mysterious, luminous hope of his Resurrection. 2017 Divine Mercy Holy Hour Sunday April 23 at St John's in Bellefonte. 2pm: Holy Hour of silent prayer; 3pm: Divine Mercy Chaplet and Benediction. See the calendar for more information!